The ARO tower is nearing completion, and the building has already been honored with a pair of prestigious design awards. Before construction even began, architecture firm CetraRuddy’s striking design received Architecture Podium’s 2015 International Architecture Award and the 2015 SARA National Design Award. 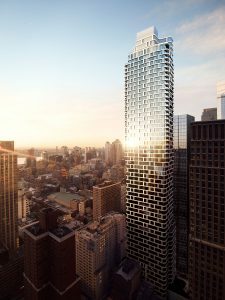 Now that the final touches are being put on the building, it’s easy to see why the design garnered such attention: in Midtown West, a neighborhood known for traditional Manhattan architecture, the curvy, 700-foot glass and white-aluminum tower is a breath of fresh air. ARO is home to a collection of 426 no-fee Midtown West apartments ranging in size from studios to four bedrooms and featuring high ceilings, luxury finishes, and top-of-the-line appliances.